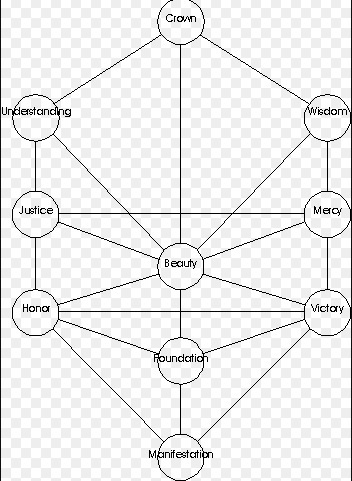 While holding a Tree of Life icon or meditating on a Tree of Life Diagram, recite the following rosary and touch the corresponding gem or sefiroth as you speak. Alternatively, you can use a string of ten beads while visualizing the Tree of Life. A single point of light, beginning and Source of All, the Fountain of Fountains, from the Crown of Keter in the Kingdom of Spirit (Clear Quartz – Keter). From the first swirlings of creation, from the farthest reaches of the universe’s Wisdom, Chokmah in the Temple of the Stars (Silver Obsidian – Chokmah). Forming in the darkness from purest Understanding, Father and Mother, Sulfur and Mercury, the first principles of all things, from Binah in the Temple of the Great Sea (Black Onyx – Binah). Infinite Mercy floods the universe, Ganymede in the service of the Cup, Chesed in the Temple of Love (Lapis Lazuli – Chesed). I follow the path of Justice and Severity, walking through fear to regain my Strength, Geburah in the Temple of Power (Garnet – Geburah). The heart of the universe is the Beauty of all things, so too am I redeemed through my Heart of Hearts, Tiphareth on the Altar of the Soul with Daat, knowledge of the Abyss (Citrine – Tiphareth). My Victory is the Secret Path, empowerment of the inheritor waiting within me, Netzach in the Garden of Beauty (Jade – Netzach). I am surrounded by hidden Splendor and Honor of the divine, living light shining in triumph all around me, Hod in the House of Spells (Coral – Hod). I stand on bedrock, relaxed at the Foundation of my own being, nourished and warmed by the Secret Fire in my soul, Yesod in the Secret Valley of the Soul (Amethyst – Yesod). The Kingdom lies Below and Above, in both created and uncreated worlds, outside me and within me, in matter and energy, concealed in the universal Salt, Malkuth in the Meadow of Delights (Tiger Eye – Malkuth). Grounded in eternity, I am at peace in the Kingdom, standing on the firm Foundation of my soul, surrounded by Splendor, knowing life is my Victory, seeing the Beauty of harmony, the truth of Severity, the grace of Mercy, climbing through the heights of Understanding to touch the power of Wisdom, focused through my Heart of Hearts on the simple light of the Crown of Spirit, which is my journey’s end.